Even without giving up to nostalgia, it is easy to spot in photography examples of “they don’t make any more things as they used to”. The last I bumped into is the old Nikon polarizer filter. This old Nikon filter shines over its modern competitors for three important reasons, that have nothing to do with optical quality, but rather with ergonomy. 1. a beautiful leather case, shaped so that the filter can quickly and easily extracted and put back – this is extremely important on the field and allows for a safe operation. 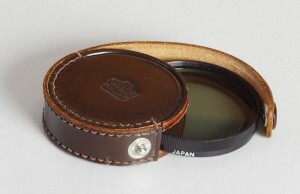 2. a dedicated lens hood, of diameter larger than the original filter thread (52 mm on the lens side, 60 mm on the hood side). This hood is twice beautiful: on one hand the larger diameter allows generously for wide-angle lenses; on the other hand the hood, carefully machined in metal, is made of two components and can cover a whole range of important focal lengths. The knurling is repeated on the hood. It’s worth noting that old Nikkors all kept the same “standard” 52 mm diameter thread for filters, so this combination of polarizer and hood could really be considered a universal investment. 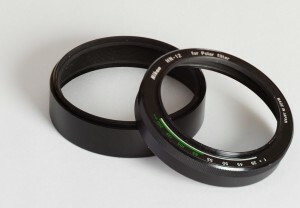 3. other fillters are made of two rings: one stays fixed (screwed onto the lens), one must be rotated, with the fingers, in order to change the polarizing effect. 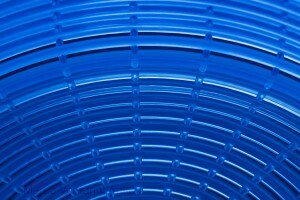 Good filters are superthin, to allow for wide-angle lenses; this however means even thinner ring to grab, and very little comfort. 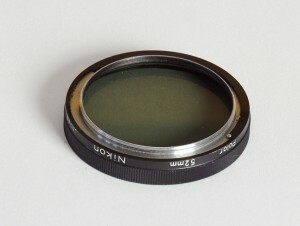 Nikon filter is exceptionally unique: the ring is wide and all to be grabbed for rotation: the fixed frame that screws onto the lens is not exposed outside, improving user’s ergonomy. 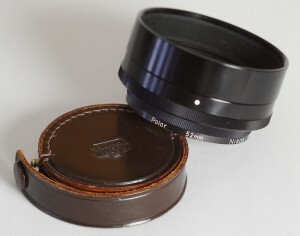 While the hood arrived to me via an eBay auction, I must thank my father for having passed me the original polarizer!